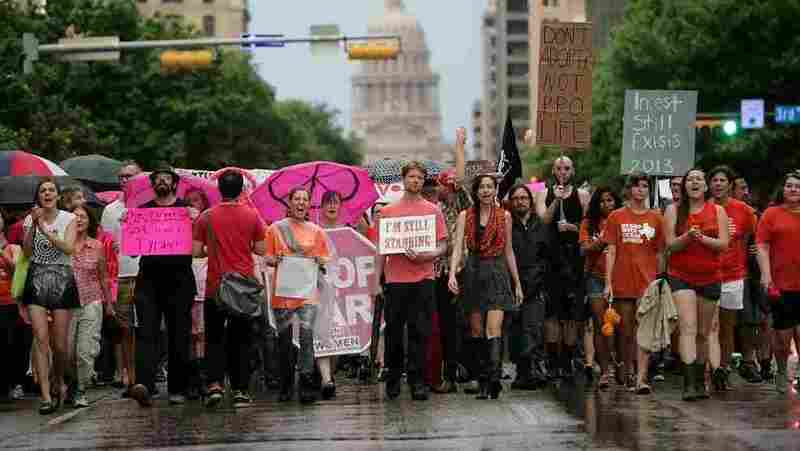 Clinics Close As Texas Abortion Fight Continues Some clinics say they can't comply with a Texas law set to go into effect next week. It adds building requirements for clinics and places more rules on doctors who perform abortions. Laws like the one in Texas have passed in more than a dozen states. In July, abortion rights advocates marched in Austin, Texas, to protest legislation that could shut down all but five abortion clinics and restrict abortion rights throughout the state. The fight over abortion in Texas is being played out in federal court, where abortion rights activists are challenging a new state law. The measure bans abortions at 20 weeks, adds building requirements for clinics and places more rules on doctors who perform abortions. Some clinics have shut down, saying they can't comply with the law set to go into effect Oct. 29. Abortion rights activists call the new law a dramatic change that will affect all clinics across the state, including a huge Planned Parenthood facility in Fort Worth that opened in June. It's a $6.5 million center with three surgical suites and 19,000 square feet of space, built specifically to meet the building standards that activists saw coming. "You know, we did not think the laws would come as quickly as they did," says Ken Lambrecht, president and CEO of Planned Parenthood of Greater Texas. He says three nurses are required to be in the clinic when abortions are performed. The law also mandates the size of operating rooms, the type of ventilation systems and the width of the hallways. "You could fit at least two gurneys in this hallway, and it's the size of many hospital corridors," he says. "And it's certainly not necessary for the procedure." Lambrecht says there's no medical basis for the new law. He thinks the law is intended to increase costs and shut down clinics, most of which do not meet the new building codes. Abortion rights groups are challenging the law. At a hearing this week, the state's attorney argued that Texas has the right to regulate clinics and has an interest in protecting the rights of the unborn. "If the woman chooses to proceed with the abortion, she should have the best care and best environment possible," says state Rep. Jodie Laubenberg, who sponsored the measure. She says the law is designed to make abortions safer. "Why would anyone argue against making it a better place and a better environment?" she asks. "If a clinic closes, that is their choice. We're not forcing anyone to close." Laws like the one in Texas have passed in more than a dozen states. As a result, clinics have closed in states from Virginia to Ohio, and in Texas. Another provision threatening to close clinics requires doctors to have admitting privileges at a hospital within 30 miles of a facility. But hospitals do not have to grant admitting privileges. Some say doctors must live in the local community. Others require them to admit a certain number of patients. Some don't approve of abortion. The doctor in Fort Worth does have privileges, but the hospital is too far from the clinic. That means the brand new Planned Parenthood center there would also have to stop performing abortions. Across the vast Texas plains, more than 300 miles from Fort Worth, is the city of Lubbock, in the northwest part of the state. It's just an hour from the New Mexico border, and it's home to a much smaller Planned Parenthood clinic. The facility recently stopped scheduling appointments. Annie Jones recently had an abortion. She's a single mother working and going to school in Lubbock, and she has a 2-year-old daughter, Molly. Jones, who is 28, says she decided to have an abortion because it was best for her family. "I knew that if I decided to have the second child, I would be doing it a disservice," she says. "I'd be doing my daughter a disservice because I wouldn't be able to care for them in the way that they deserved." At least three Texas clinics have closed since the law passed, and Jones is worried that this center could close, too. "I think that the people who are passing the bills ... are trying to legislate morality, and they see abortion as wrong," she says. For abortion opponents, passing the measure after a filibuster was a big victory. When Republican Gov. Rick Perry signed the bill, he said it would further what he called "the culture of life in Texas." "It is our responsibility and duty to give voice to the unborn — the individuals whose survival is at stake," Perry said. But abortion rights activists say the right to an abortion was decided 40 years ago. Angela Martinez, director of the Lubbock clinic, says if her facility closes, women seeking abortions would have to travel more than 300 miles. "We are the only clinic in West Texas who sees patients and performs abortions," Martinez says. "It's frustrating for me. It's frustrating for my staff, just because ... we want to be available." Just outside the clinic on a recent crisp morning, a few protesters stand holding signs. Krysten Haga says she sees the law as a first step, not as the end of this debate. "I'd like to see abortion completely banned in the United States," Haga says. "That's ideally what we're looking for — is for abortion to not be an option at all." A federal judge is expected to rule soon whether part of the new Texas law will go into effect next week.